“Power tends to corrupt, and absolute power corrupts absolutely. Great men are almost always bad men.” While often attributed to JFK, Winston Churchill, and Richard Nixon, 19th century moralist and historian Lord Acton originally penned this famous quote in 1887 in a letter to Bishop Creighton as part of their ongoing correspondence regarding moral standards as applied to religious and political leaders. Clearly, the quote is just as relevant today as it was then. Intoxicated by the power they command, abuses come in many forms including those of a sexual nature, and indiscretions, proven or not, don’t stay hidden for long. Unfortunately, the families and victims of powerful men are often caught in the crossfire. City Lights again tackles a ticklish work, this time focusing on the children of a politician accused of wrong doing. Rob Handel’s “Aphrodisiac” is loosely based on the Gary Condit – Chandra Levy case. The plot follows the disappearance of Ilona Waxman, an intern working for the Federal Bureau of Prisons. Alma and Avery’s father, Congressman Dan Ferris, is suspected of sexual impropriety with Waxman and worse. Not knowing whether the allegations are true, Alma and Avery attempt to find out by employing their long established pattern of role playing. This creates some interesting situations considering they engage in parts of their investigation in public places. In the midst of their discussions, Monica Lewinsky arrives on the scene, simultaneously clarifying and confusing issues related to their concerns. Handel has written lengthy monologues to throw a lot of speculation at the audience as the story unfolds. Portions of the diatribes are pulled from known facts of the stories on which the play is based, but those segments are twisted toward dark humor highlighting the fallibility and abuses sometimes propagated by those wielding significant power. Director Lisa Mallette brings CLTC regular George Psarras (Avery), Kate McGrath (Alma), and Amanda Folena (Monica) together in this alternately dark and humorous tell-all tale. Psarras does double duty as sound designer employing his original music to cover scene changes as he creates a modern, seductive, and somewhat mysterious mood. Voiceovers of newscasters questioning the congressman or discussing the case are used to open each scene. The play begins in a Korean restaurant in Washington D.C. where McGrath and Psarras appear to be Ilona Waxman and Dan Ferris discussing their relationship over dinner, although we later realize they are really Alma and Avery, and this is our first exposure to their role playing. At first, McGrath is very stilted and over exaggerated in her diction and is not really believable. As the discussion continues, she eventually breaks into uncontrollable, hysterical laughter, and at that point, she seems more real. Psarras as Ferris is a little dry, and he uses a Southern inflection in his diction. Their discussion gets rather heated and ends with “Ilona” breaking dishes on the floor at the end of the scene creating a challenge for the stage crew to execute the set change in an expeditious manner. Perhaps City Lights should invest in a larger push broom to allow the broken crockery to be moved aside more quickly. The next scene is in Avery’s apartment where lights come up while a taped interview between Ferris and a newscaster is playing. Psarras and McGrath are Avery and Alma when they begin the scene after the tape is shut off. They are still trying to figure out the truth of the allegations against their father, and as “themselves”, they are more believable, but they quickly lapse into more role playing, Psarras as Ferris again, while McGrath remains Alma launching into a slightly affected tirade exploring her father’s alleged sexual predatory behavior. As the living room scene progresses, Psarras delivers a lengthy monologue as Avery doing impressions of Keith Richards, Bill Clinton, and Willie Nelson along with his father. While his impressions of Richards, Clinton, and Nelson aren’t perfect, they effectively portray those personalities in the animated discussion he’s having amongst them, pacing while recounting a conversation Avery and Alma imagine happened. Through most of this, McGrath is an active observer. Following Avery’s apartment, the action jumps a year in time and moves to a New York coffee shop, where once again Alma and Avery engage in role playing. After a short dispute, Avery plays Alma and Alma plays Ferris which Psarras and McGrath do rather convincingly. This time; however, Monica Lewinsky eventually also settles into the coffee shop, and overhearing their discussion, starts chiming in. Folena makes a convincing Monica, physically looking the part, but also telling her story with humor in a sympathetic way bringing home the abuse that is rampant in corridors of power. Starting in a conversational tone, Folena quickly lapses into a lengthy soliloquy accurately recounting the abridged Lewinsky story in a most compelling way. Though the real story’s ending is known the play’s ending is a bit more unsettling and abrupt. Scenic designer Ron Gasparinetti’s set is sparse, but creative. Moveable white curtains are positioned along an arced track and are interspersed with black curtains in varying degrees to create a majestic background to a restaurant, living room, coffee shop, and inside a car. 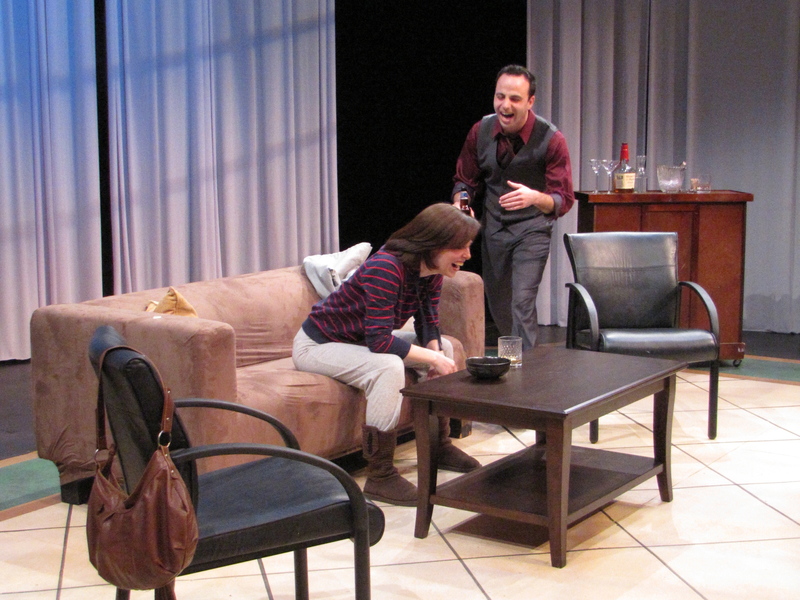 Appropriate furnishings finish each set, although the tempo of the set changes between scenes needs to speed up. While not appropriate for very young children due to its mature theme and language, “Aphrodisiac” is worth seeing and continues at the City Lights Theater Company Thursdays – Sundays through 19 February 2012. Performed as a one-act, this is a short show running slightly under 90 minutes. Please see: http://www.cltc.org or call 408-295-4200 for more information. Note that City Lights is trying something new this time around. They’ve set up “Tweet seats” in the back row of both side sections of the theater for those who want to “tweet” their way through the show.